alaTest has collected and analyzed 183 reviews of LG 32LH604 Series. The average rating for this product is 4.2/5, compared to an average rating of 4.3/5 for other products in the same category for all reviews. Reviewers are impressed by the size and sound. The price and image quality also get good comments, whereas there are some mixed views about the reliability and connectivity. We analyzed user and expert ratings, product age and more factors. Compared to other products in the same category the LG 32LH604 Series is awarded an overall alaScore™ of 90/100 = Excellent quality. 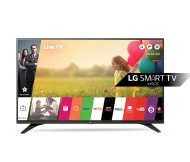 alaTest has collected and analyzed 1 user review of LG 32LH604 Series from Amazon.co.uk. The average user rating for this product is 2.0/5, compared to an average user rating of 4.3/5 for other products in the same category on Amazon.co.uk. Reviewers really like the sound and image quality. Very slow controls - need patience when operating tv - especially EPG . It looks good and once you have mastered the remote, quite easy to use. We bought a smaller version first but decided that it would be better in the kitchen. The 32in is great in the bedroom as I don't need mu glasses when watching it! It's a great TV. The under spec'd processor makes it sloooow. I can understand why they would want to sell off stock and launch a better product. Great value....if you're not the type that watches a microwave oven and screams 'hurry up!'. A little slow flicking between channels but 90%of the time very speedy and good apps to use.